“Clean With Passion For Now” is the next JTBC drama to be released after “The Beauty Inside” on November 26. It’s another drama based on a webtoon named “Ildan Ddeugeobge Chungsohara” by Aaengo. It cast is headed by Kim Yoo Jung as Gil Oh Sol an attractive, disorderly girl looking for a job, Yoon Kyun Sang as Jang Sun Kyul a cute CEO but a completely mysophobic, germ-free guy and Song Jae Rim as Choi Gun, the mysterious man of the roof. Who is a completely original character, that does not appear in the webcomic since it was only created for the drama. These will be the main characters that give life to this romantic story. It also highlights the participation of Kim Won Hae as Gil Gong Tae, Lee Do Hyun as Gil Oh Dol, Yoo Sun as Secretary Kwon and Kim Jung Nan as Cha Mae Hwa. “Clean With Passion For Now” was to be broadcasted after “Laughter in Waikiki”, so the drama recordings began during the first week of February 2018, but the production of the drama decided to reschedule the drama recordings until actress Kim Yoo Jung recovered from hypothyroid surgery. Due to this, the broadcast date of the drama was rescheduled for the second half of 2018 and for agenda conflicts reasons (with the filming of “Thirty But Seventeen”) the actor Ahn Hyo Seob who at the beginning was going to play the main character of Jang Sun Kyul retired from the production. 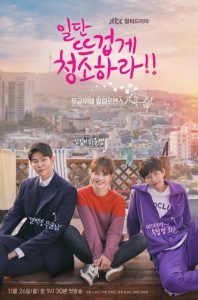 “Clean With Passion For Now” tells the love story between two opposite people, a man with mysophobia (the fear of germs) and a woman that doesn’t care about cleanliness at all. Jang Sun Kyul, CEO of a prestigious cleaning company, is a man focused on his vocation to clean forever for life. He has an incredibly perfect appearance as well as great wealth but suffers from a severe mysophobia to the point that he not only refuses to touch other people but also cannot stand a single speck of dust in his environment, he hates germs altogether and is obsessive about leaving everything perfectly shiny. Although, his life is turned upside down with the intervention of Gil Oh Sol, a woman with a brilliant personality, someone who has given up cleanliness in the face of his harsh reality and who helps Jang Sun Kyul face his fear of germs. The “Clean with Passion for Now” team reported: “Based on their strong acting skills, Yoon Kyun Sang and Kim Yoo Jung have created new characters compared to the webtoon. The chemistry of the Song Jae Rim couple is also extraordinary. The actors maximize the charms of the original and show unique and different elements of their characters. The drama will convey an exciting and warm story and allow viewers to experience the fun at the expense of these unique characters. This drama will undoubtedly have to fill the great emptiness left by the popular drama “The Beauty Inside“. however, it has an attractive plot and a cast that is expected to give us a good drama, loaded with romance and good chemistry between the characters. Wait for the healing romance of these talented actors.